Manchester United twice came from behind to earn a draw against Arsenal in this Premier League contest at Old Trafford. Jose Mourinho made a number of changes to his team, leaving Paul Pogba and Romelu Lukaku on the bench, but the hosts fell behind midway through the first half when David de Gea could only palm a header from Shkodran Mustafi into the back of his net – goalline technology confirmed that Ander Herrera had failed to clear in time. Anthony Martial equalised moments later, though, and Unai Emery looked to his substitutes to inspire his attack in the second half. Alexandre Lacazette was introduced and was soon involved in the goal that restored his side’s lead, officially given as a Marcos Rojo own goal. But Jesse Lingard hit back seconds later, with both sides ultimately forced to settle for a point neither would be truly happy with. Manchester United set up in a somewhat experimental 3-4-2-1 structure, with Anthony Martial and Jesse Lingard as narrow attacking midfielders behind lone forward Marcus Rashford. When building through midfield, the central back three would split, leaving Chris Smalling in the centre. Should Arsenal’s front three step high to press, Nemanja Matic would drop just above the back line to create a four-on-three overload. Matteo Guendouzi soon stepped forward from central midfield to press Matic, though – particularly when the Serbian faced his own goal. With Matic able to shield and protect the ball, and Guendouzi no longer blocking United’s advanced midfielders, the hosts could centrally penetrate through their opponents’ mid-block. Ander Herrera’s clever movements away from the central lane pulled Lucas Torreira out of position, which provided Lingard with enhanced space to get on the ball and dictate play. Runs in behind from one of Martial or Rashford also enhanced these spaces. Despite going a goal down during an impressive spell from Arsenal, United were soon level. A routine free-kick was comfortably saved by goalkeeper Bernd Leno, but Herrera was first to react to the rebound, and his subsequent low cross was smashed home from close range by Martial. Smart movement and direct play from Martial and Rashford rejuvenated the home side in the second half, as they enjoyed more success from higher pressing. 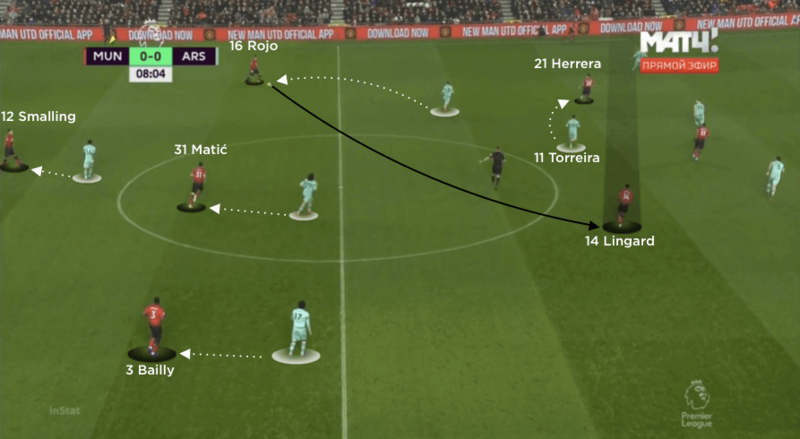 As Arsenal’s back three split to play out from the back, both inside channels became ideal locations for the speed and attacking intent displayed by both forwards. Rashford dropped much deeper towards the ball, while Martial remained higher to stretch in behind. From here, right wing-back Diogo Dalot made more penetrative runs forward on the right, with Rashford linking well with through balls in behind. But with Rashford deeper, United lacked finishers in and around the penalty area. The hosts added an aerial threat to their attack when Romelu Lukaku replaced Martial, and his presence immediately paid off. Less than 15 seconds after Arsenal had taken the lead once more, the Belgian battled for a long ball and, following some hesitant defending, Lingard poked home from close range. 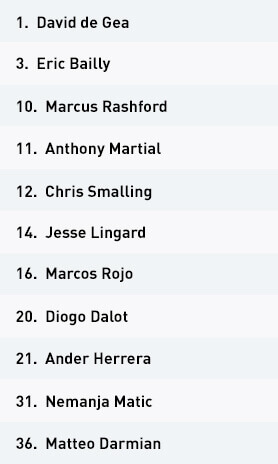 United eventually adapted to attack with a diamond 4-4-2, with Marouane Fellaini added to the midfield unit. They now looked to go direct to Lukaku, with Lingard – who was later replaced by Paul Pogba – at the tip of the diamond, providing extra supporting runs from deep to help win the second ball. 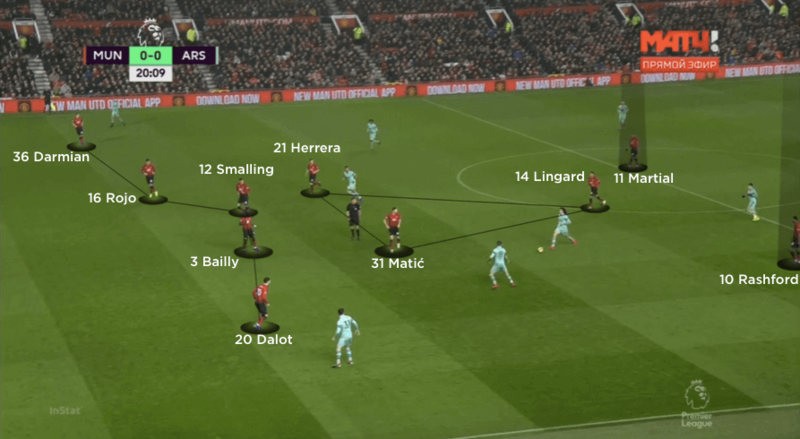 Throughout the opening spell of the first half, United set out to aggressively press Arsenal’s back line, particularly during moments of transition. Their intensity as they lost the ball in their opponents’ half was impressive, and this led to an early dominance of possession. 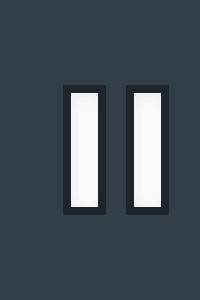 When they failed to recover possession, however, they dropped into a 5-3-2 mid-block. Martial and Rashford were positioned as the two central strikers, with Lingard the central player in the midfield trio – this offered an immediate threat in behind should they recover the ball and look to attack quickly. As Arsenal sustained more possession over time, though, United struggled to reinstate their intense pressing. 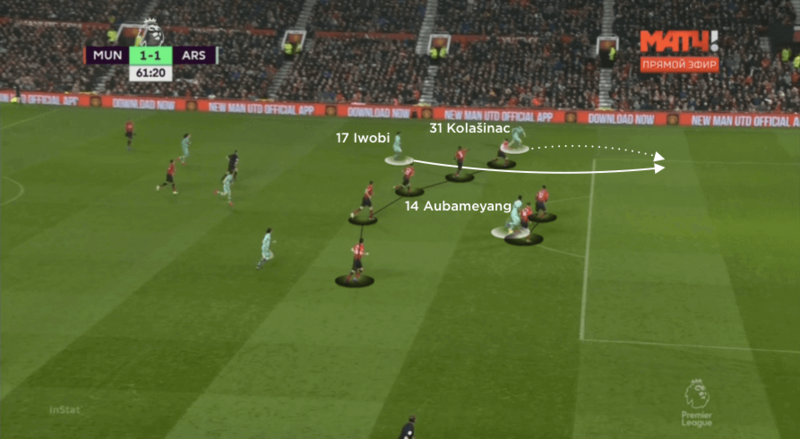 With Aaron Ramsey and Alex Iwobi dropping deeper to assist the build, United didn’t have the numbers to effectively press – intelligently, they retreated into a mid-block. 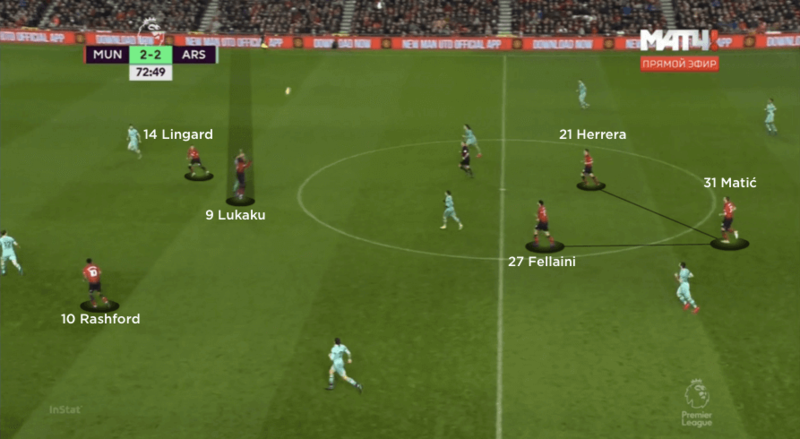 Despite trying to remain defensively compact, United struggled with diagonal runs from Arsenal’s wing-backs – through balls in between their own wing-backs and the nearest centre-back was a frequent problem. It was from a run by Sead Kolasinac that Arsenal won the corner from which Shkodran Mustafi opened the scoring. The intensity of United’s press resumed in the second half, and their defence became more proactive in pushing the wing-backs higher – although after the visitors made their substitutions Dalot sat deeper, perhaps concerned by the pace of Pierre-Emerick Aubameyang. 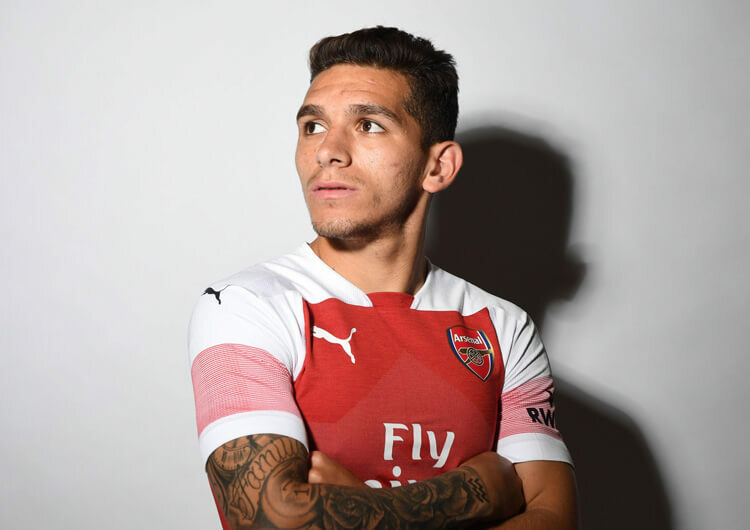 In the end, it was a mistake from Rojo that gifted the visitors possession, and the Argentine went on to deflect the ball into his own net to gift Arsenal another lead. After Lingard’s quickfire equaliser, however, both teams had to settle for a point apiece. When the Manchester United back line had possession, Arsenal would look to push players up on to them. That allowed Jesse Lingard to find enhanced space in central areas – especially as Ander Herrera often dragged his man away from the central lane. Leaving two strikers high when in their 5-3-2 mid-block provided United with pace and quick rotations in attack, allowing for a quick counter after a regain. With Romelu Lukaku and Marouane Fellaini introduced in the second half, the hosts used a midfield diamond to support long balls into the Belgian striker. Lingard made good supporting runs from the tip of the diamond – as evidenced with the hosts’ second equaliser of the night. 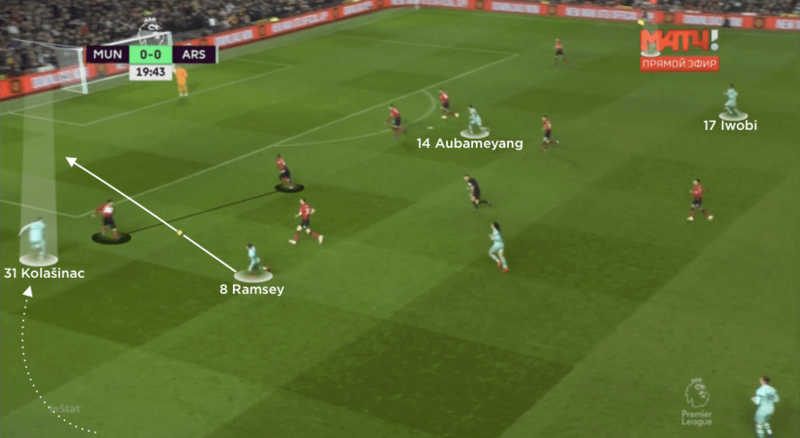 In possession, Arsenal’s attacking midfielders Aaron Ramsey and Alex Iwobi frequently dropped back to help with the short build from the back. As a result, wing-backs Sead Kolasinac and Hector Bellerin began wide before surging inside to provide the penetration. 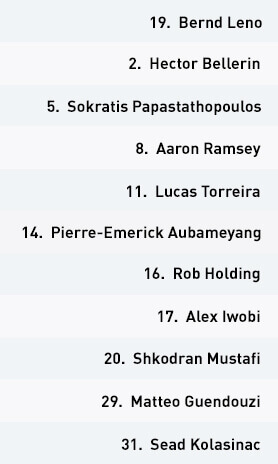 Arsenal converted to a 5-4-1 out of possession. With lone forward Pierre-Emerick Aubameyang isolated during counter-attacks, United frequently recovered the ball during moments of transition. Arsenal’s left side wasn’t as successful in the second half, but they still created openings. United’s back line struggled to cut off access, with their defensive structure often inconsistent and disoriented. Unable to secure sustained periods of possession in the opening exchanges, Arsenal looked to attack on the break after regaining the ball. 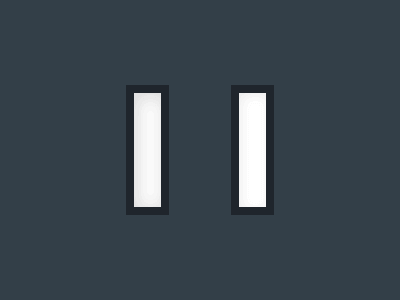 However, when out of possession, they often formed a 5-4-1 mid-block – as a result, they only had Pierre-Emerick Aubameyang as a central attacking player to hit with early forward passes. Aaron Ramsey and Alex Iwobi were too far away to effectively link the play and help regain second balls. As the visitors gradually created longer spells with the ball, Iwobi and Ramsey dropped very deep to collect the ball at feet – even when spaces were available in behind for a more direct approach. 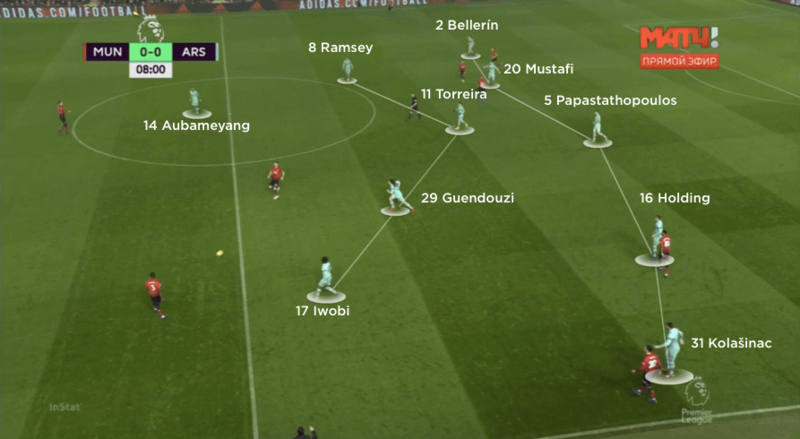 This resulted in a more patient attacking style, but with Iwobi and Ramsey dropping deeper, Aubameyang desperately needed supporting runners in behind. It was therefore crucial that wing-backs Hector Bellerin and Sead Kolasinac penetrated in behind to provide crosses and cut-backs. 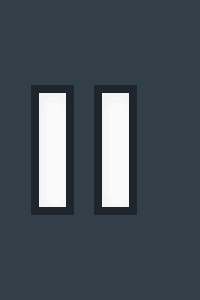 Both made repeated diagonal runs into the inside channels, behind opposition wing-backs who were perhaps marking them too tightly – and one such run from Kolasinac on the left resulted in the corner from which Shkodran Mustafi headed Arsenal into the lead. The Gunners were forced into a change of personnel for the second half, as the injured Ramsey was replaced by Henrikh Mkhitaryan. With intensity still missing from their attack, Alexandre Lacazette was also introduced to add a spark – and the two substitutes combined in a move that began and ended with Marcos Rojo mistakes as Arsenal regained the lead. The visitors did create the two best chances after they had conceded again, as both Mkhitaryan and Aubameyang missed from close range after good work by Kolasinac down the left. The Bosnian’s overlaps soon reduced, however, as Aubameyang remained much higher on the left, providing a more obvious attacking threat. His shot after cutting inside acted as a timely reminder for United’s defence not to allow the Gabon international too much room. Out of possession, Arsenal left only one player up front as opposed to the two Manchester United left in advanced areas. While both teams had the pace to run in behind, United looked far more dangerous on the break, with their strikers able to rotate and change their role. 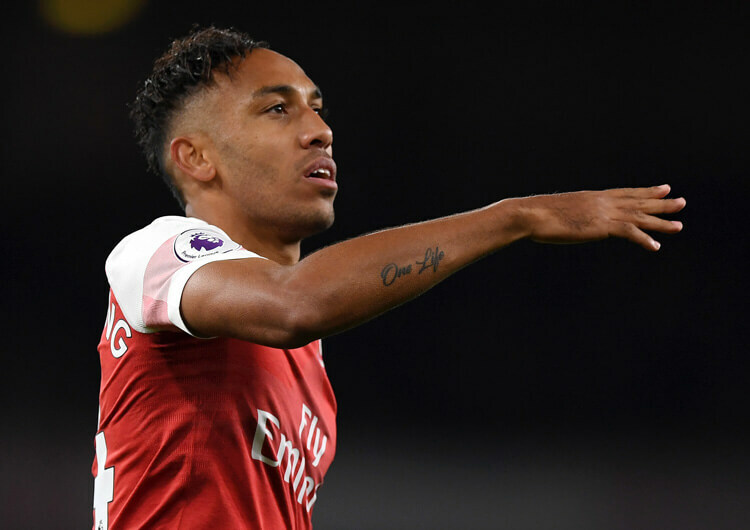 Conversely, Arsenal only had Aubameyang high – although they were eventually able to sustain more possession through a consistent overload during the first phase of the build and clever use of their wing-backs.  Unai Emery will have been frustrated at his team’s failure to deal with a simple free-kick, however, cheaply conceding during the second phase after an initial low save from Bernd Leno. Arsenal were once more put under pressure as the second half got under way. A more proactive approach from Diogo Dalot on the right of the United build forced Kolasinac deeper than he had been to that point. 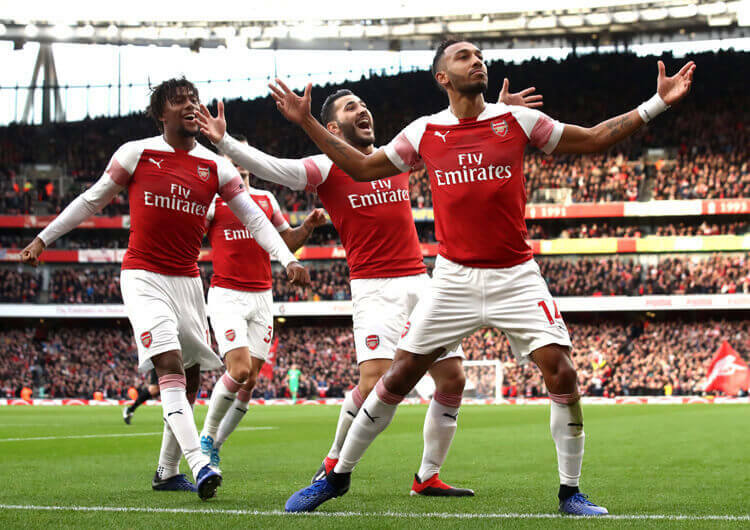 The introduction of Lacazette and Aubameyang’s shift to the left helped push Dalot back once more, however, and once the Gunners had regained the lead they would have hoped to maintain it for more than the 15 seconds they did. Instead, a miscommunication between Leno and Kolasinac allowed Lingard to pinch a second equaliser, and the points were shared.